Welcome back to History Undressed, guest author Jack Caldwell. I adore Jack's work. He is an amazing author and has put some fantastic spins on Jane Austen fanfic! Today he's entertaining us with a bit of Regency history. Enjoy! Leave a comment for a chance to win Jack's new release, The Three Colonels. Greetings, fellow history lovers! Jack Caldwell here, author of THE THREE COLONELS – Jane Austen’s Fighting Men, the epic, romantic sequel to Pride & Prejudice and Sense & Sensibility, from Sourcebooks Landmark. I take the critical event of the Regency period in English history—the Hundred Days Crisis—and throw some of literature’s most beloved characters into that maelstrom. In other words, I send some of Austen’s military figures to Waterloo. From S&S are Marianne and Colonel Brandon, Elinor and Edward Ferrars, and John Willoughby. From P&P are Colonel Fitzwilliam, Anne de Bourgh, Lady Catherine, Fitzwilliam and Elizabeth Darcy, the Collinses, Wickham, Denny, and Caroline Bingley. I have original characters, like Colonel Sir John Buford, and they interact with historical figures, such as Wellington and Napoleon. Please allow me a brief explanation as to why Waterloo was so critical a moment in history. Since 1792, most of Europe had been at war against the armies of the French Revolution. 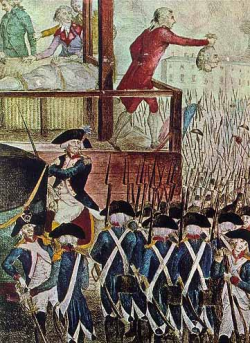 The homicidal fanatics of the Revolution wanted to spread the ideas of liberté, égalité, fraternité—and "Madame Guillotine"—across the continent and England. The crowned heads of Europe and the Parliamentary kingdom of Great Britain felt the threat and tried to extinguish Revolutionary France. Enthused with zeal, the French armies fought well against the might of various Coalitions and was able to expand France into the Low Countries while holding off for a time the forces organized against it. The Republic couldn’t hold—bad generalship externally and political instability internally brought the nation to the abyss. Then a heroic figure emerged—General Napoleon Bonaparte, a Corsican-turned-Frenchman, saved the French Army. He, with others, then conducted a coup in 1799, establishing a government run by three consuls, and Bonaparte became First Consul. The brilliant and ruthless general ended the revolutionary wars and, within a few years, maneuvered to rid himself of his fellow consuls. In 1804, he crowned himself Emperor of France. 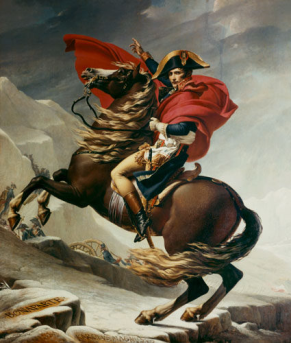 General Bonaparte had won admiration for his reforms in France and respect for his abilities on the battlefield, However, Emperor Napoleon I was something else entirely. Bonaparte was not of any royal house; he was a commoner. The crowned heads of Europe shook again. A commoner dared make himself a king? Preposterous! Why, something like that might give ambitious men all over the continent ideas! The wars started again, and Napoleon decided that if he could not live in peace with the rest of Europe, he would conquer it. He was brilliant. He smashed Austria at Austerlitz. He forced Prussia to sue for peace. He first allied himself with Spain, and then took it over. He conquered Poland (or liberated it, depending on your point of view). Russia seemed powerless to stop him. The only nation Napoleon could not defeat was Great Britain. The British continued to defy him, and for a very good reason—trade. The most valuable trade was overseas, and Britain was master of the oceans. It had colonies across the globe and the greatest navy in the world. For Napoleon to truly control Europe, the Royal Navy had to be crushed, yet France failed time and time again. 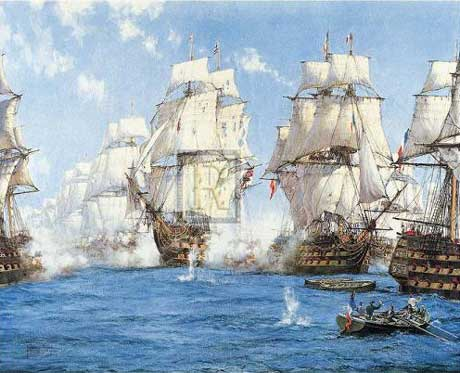 Every time the French attacked the British fleet in force, it was beaten and humiliated. Napoleon was invincible on land, but not at sea. Therefore, he tied to strangle Britain. Napoleon’s Continental System restricted trade. He hoped to either force the “greedy English” to sue for peace, least they suffer ruin, or starve the English populace into submission. However, he misjudged the nature of Englishmen. True, Napoleon had his admirers in Britain, particularly in the Whig camp of what passed for party politics of the day. But when it came to the survival of the British Isles the governments of George III and that of his son, the Regent, were resolute. They knew that for Britain to live, Napoleon had to be destroyed. Stymied at sea, Napoleon grew overconfident on land. 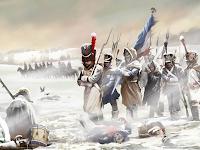 In 1812, he invaded Russia, and it was his greatest disaster—500,000 men marched into Russia in June, but only 20,000 staggered back across the Niemen in December. This was the turning point in Napoleon’s career. While he won several desperate battles in 1813 and 1814, the luster of invincibility was gone; his enemies knew he could be beaten. Unlike the past, his foes wouldn’t treat with him—they stayed in the field to fight another day. French losses mounted. Meanwhile, the British found their own heroic figure—General Sir Arthur Wellesley. His brilliant campaigns in the Peninsula (Portugal and Spain) earned him fame and reward, and he was made 1st Duke of Wellington. In 1814, Napoleon was forced to abdicate. The Allies forced him into exile on the Mediterranean island of Elba, established Louis XVIII as King of France, and began to redraw the shattered map of Europe at the Congress of Vienna. 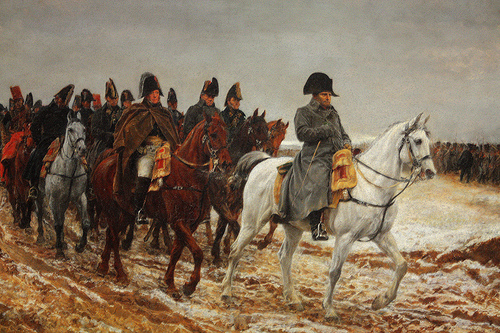 The peace did not last—on March 1, 1815, Napoleon landed near Frejus in Southern France. In less than a month, he had returned to Paris and, the Bourbon king having fled, declared himself emperor again. The Allies formed the Seventh Coalition to stop him once and for all. The British, Dutch, and Prussians would hold the north—in Belgium—while the Austrians and Russians mobilized to strike from the east. This was the Hundred Days Crisis. 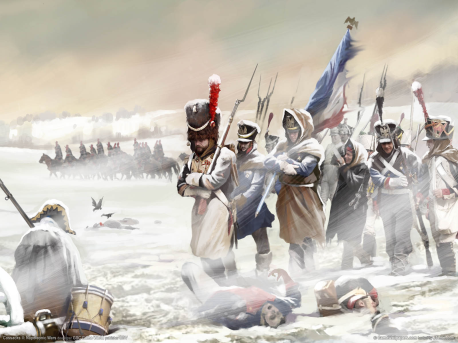 Napoleon knew he had to strike fast—the decades of war had nearly emptied France of men. He could not fight the entire Coalition at once. Always he had divided and conquered, and he planned to do it again. In his estimation, the troops to the north were the most vulnerable. He had beaten the Prussians before and was confident he would rout them again. 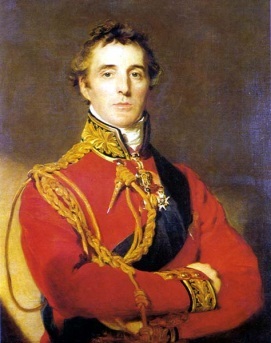 As for Wellington, he dismissed the British field marshal as a bad general with bad troops. He would crush them, expecting his victory would then so frighten the other allies that they would sue for peace. This would give him time to rebuild the French Army. Then, nothing would stop him. What happened next? That’s in THE THREE COLONELS! The impact of the Battle of Waterloo cannot be overestimated. Great Britain emerged from the wars as the premiere imperial power on the planet. Pax Britannica would dominate the world for a hundred years. France was relegated to second-class stasis (whether they liked it or not). 1815 was also the last time Britain and France would fight each other. Beginning with the Crimean War in 1853, the two nations have been allies. Waterloo is one of those pivotal moments in time. By happy coincidence, Jane Austen gave us interesting characters to borrow, through whom we can glimpse history in the making. I hope I did her justice. THE THREE COLONELS – Jane Austen’s Fighting Men is available now from your favorite bookseller. 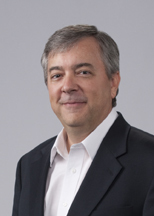 About the Author - Jack Caldwell is an author, amateur historian, professional economic developer, playwright, and like many Cajuns, a darn good cook. Born and raised in the Bayou County of Louisiana, Jack and his wife, Barbara, are Hurricane Katrina victims who now make the upper Midwest their home. Always a history buff, Jack found and fell in love with Jane Austen in his twenties, struck by her innate understanding of the human condition. Jack uses his work to share his knowledge of history. Through his characters, he hopes the reader gains a better understanding of what went on before, developing an appreciation for our ancestors' trials and tribulations. When not writing or traveling with Barbara, Jack attempts to play golf. A devout convert to Roman Catholicism, Jack is married with three grown sons. Jack's blog postings—The Cajun Cheesehead Chronicles—appear regularly at Austen Authors. your online stories are wonderful - Pemberley Ranch is so good - I know the Three Colonels will be the best - Napoleon intrigues me and I would love to see how Darcy, Fitzwilliam and Brandon handle him! very great group of characters! Following The Three Colonels on this blog tour has been wonderful. I'm finding all these new blogs that I had not seen before. Thank you Jack! Yes! The hundred days and Waterloo was an incredible time. I've read army diaries of men who were scrambled for the big match up. I look forward to reading your book. Thanks for the well written post. Thanks for the blog. I find a book with these 3 colonels just very fascinating. I can't wait to read it. BTW, are any of your books available via book on CD? I enjoy audio books. GranJan - Thank you for your kind comments about PEMBERLEY RANCH. LilMissMolly - As of now, none of my novels are audio books. Thank you, each and every one of you, for your support of THE THREE COLONELS. And thanks, Eliza, for giving me the opportunity to post here at HISTORY UNDRESSED. It's been fun! Really liked this post and finding yet another Sourcebooks Landmark treasure. I love the Austen genre and history so Jack Caldwell might just be writing for me and I did not know it. Thanks for stopping by, I look forward to reading your works. Maybe it will start with a copy of THE THREE COLONELS. Thank you for the synopsis of Waterloo and how it ties back to Jane Austen or the other way around. Look forward to reading this work. Thanks HistoryUndressed for featuring Mr. Caldwell. Really interesting snapshot, looking forward to hunting up the book now. Thank you, Jack, for visiting with us!!! Always a pleasure. The winner of today's book giveaway is.... Margaret!!! This is a must read! Added to my TBR and WL.